Regan Pifer writes that there are “rules” and then there are RULES. The former, you know, are just sort-of suggestions. We’d really like you to follow this policy, it is heavily suggested that you do…but, we won’t really do anything if you violate it. Have a nice day! The latter, on the other hand, are carved-in-stone-tablets rules. You follow them. They’re enforced. Or…else! But, for some individuals it doesn’t matter if the rules are “rules” or RULES. They don’t follow any of them anyways. Take, for example, the National Football League. Yup. You read that correctly, a whole 23 days! The average time between arrests is just seven days, while the record without an arrest is slightly more than two months, at 65 days, according to NFLarrest.com, which “provides an interactive visualized database of National Football League player Arrests & Charges,” the site says. Team with the most arrests? The Minnesota Vikings. Rounding out the top five are the Denver Broncos, the Cincinnati Bengals, the Tennessee Titans, and the Jacksonville Jaguars. The worst year for arrests (71) was over ten years ago in 2006. But, 2017 is off to a “great” start as the players of the National Felon League have already had 32 arrests by week 3. From assault and battery to drugs to DUIs to domestic violence to disorderly conduct, players are subject to all sorts of charges. But, DUIs, drugs, and domestic violence are at the very top of the list, and we have so many more weeks to go! It’s pretty ironic that those who want to get on their moral high horse, raise awareness concerning police brutality, and crusade for their ‘rights’ are the same individuals who have absolutely no respect for the law or law enforcement. It is pretty darn difficult to stand on any sort of moral ground and demand change from law enforcement when you don’t respect the law. 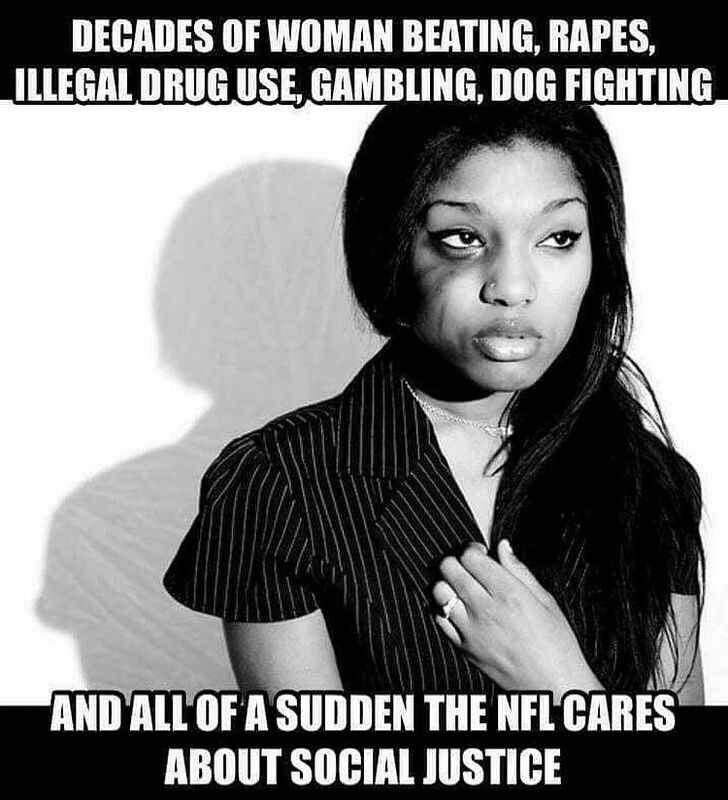 Maybe, just maybe, the players of the National Felon League aren’t the best to speak out and demand change. If they want to raise awareness for police brutality, let us also raise awareness for domestic abuse, driving under the influence, assault and battery. Let’s make sure that those who exercise their “constitutional right” (as Goodell would say) to kneel are also held accountable for their actions off the field.